What is a Guitar Sustain Pedal? How exactly do Guitar Sustain Pedals work? What are the Top Guitar Sustain Pedals? Conclusion – Which Guitar Sustain Pedal do we recommend? Guitar Sustain Pedals are effects processors that enable a guitarist to prolong the length of the guitar’s output signal, so that the signal that is transferred to the amplifier is longer in length, or for lack of a better word ‘sustained’. A guitar sustain processor is commonly used within both a live performance environment and within a recording studio setting. A lot of beginner guitarists mix up sustain pedals with delay pedals; A sustain pedal will prolong the input signal, where a delay pedal will relay the input signal and play it several times, only milliseconds after, which is why it’s heard as a delay. Unlike several other pedals that one might consider to be more rudimental or mandatory, such as a guitar tuner pedal. Sustain pedals are chosen more on the basis of musical taste and on the desired sound that wants to be achieved, with a wide variety of bands using sustain within their recordings and live performances from Muse through to Metallica. Ok, so as previously mentioned, the Sustain effect is merely an extension of the current signal that is being played. However, the sustain process actually comprises 4 main segments. These are Attack, Decay, Sustain and Release, the acronym for this is ADSR for short. The process starts with Attack, which can be understood as the time taken for the sound wave to rise from 0db to its maximum level. And finally, the release is the time taken for the sound to move from a ‘sustained’ level, to its final level, typically when the note is ‘let up’ by the musician. A guitar sustain pedal will essentially take a signal through this exact process, with the ability to manipulate certain settings such as the Attack, Decay, Sustain and Release of a signal, also known as it’s Envelope. A common question that we get here at Sustain Punch is “Where should I place my Guitar Sustain Processor in my guitar effects chain” and the answer to this is that there are simply no rules in ordering of your effects pedals. However, we would say that given the fact that this pedal will be operating on the entirety of your signal, and you’ll most likely want this to be the ‘post’ processed signal, positioning this pedal towards the end of the signal chain would probably be a wise idea. Although, we highly advise that you play around with the positioning of your pedal-board until you’re happy. Now, let’s get to the good part of displaying all of the best guitar sustain pedals in our list. However, if you’re limited for time, please refer to our conclusion, where we summarise and justify our recommendations. Although if you do have the time, take a look at all of the pedals, including the reviews and video demonstrations of each synthesizer unit in action. 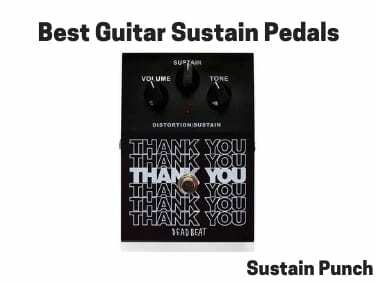 So let’s get to it, what are the best guitar sustain pedals of 2019? The Behringer CS400 Compression/Sustain pedal has received an average rating of 3.9* out of 5 stars from over 265 Amazon customer reviews – Read these reviews here. The Behringer CS400 Compression/Sustain pedal is an ideal solution for any guitarist who’s after a sustain pedal, but without the large price-tag. At only $25, it’s incredible to think how Behringer make a profit with providing guitar effects at this price. Instead, this German-Designed and Built processor will offer a decent compression/sustain effect; Nothing to blow your mind, but it will do the job! The interface has four main control knobs, which are Level, Tone, Attack and Sustain. The level control will adjust the output signal db, the tone control will adjust the overall tonality, or shade of the signal, the attack control will adjust the level of time in which the unit will begin compression, and finally the sustain knob will adjust the amount of signal sustain that is added to the signal. Ok, so considering the unit’s price, there really isn’t much we can say to improve. Only, any improvements would most likely, directly affect the price; So taking this into account, knowing that the price it it’s unique selling point, we can’t make any improvement suggestions. The Behringer CS400 Compressor/Sustainer Pedal is DEFINITELY for the guitarist on a budget. Otherwise, at $25 this pedal will make for a perfect back-up sustain pedal in case you’re looking for some gear for touring. However, before you decide on this pedal, we recommend looking at the Harley Benton JOYO JF-10, which we’ve reviewed further below… The video demonstration alone was enough for us to fall in love with the compressor/sustain unit. The JOYO JF-10 has received an average rating of 4.1* out of 5 stars from over 1914 Amazon customer reviews – Read these reviews here. The JOYO Dynamic Compressor/Sustain Pedal for guitar is another ideal budget-priced solution for those guitarists who are not looking to spend much $$. Although this brand is not as well known as the likes of Behringer, it has still managed to sell well, with over 1900 customer reviews, averaging around 4.1*. However, as you can see from the video demonstration of this unit, the sound quality is AWESOME! We were so impressed with it, we can’t help but recommend this over the Behringer. Therefore, if you have another pedal or on-board amplier effects to handle your guitar tone, and you’re on a budget, this is for you! Again, considering this is another budget-price compression/sustain pedal, we’re hesitant to make improvement suggestions. Mainly because any suggested improvements would directly affect the units cost, and that would negatively impact on it’s USP. 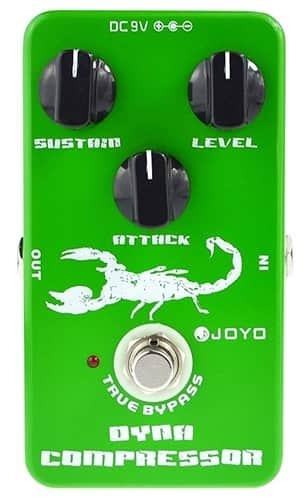 The JOYO JF-10 Compressor/Sustainer Pedal is another pedal DEFINITELY for the guitarist on a budget. We recommend that any reader who doesn’t want to pay more than $32, but requires an awesome compressor unit chooses this pedal. Hence, we award this pedal our Editor’s Budget Recommendation. Well done Harley Benton! The Dead Beat Thank You pedal has received an average rating of 4.6* out of 5 stars from over 18 Amazon customer reviews – Read these reviews here. The DeadBeat Thank You is a sleek-looking distortion/sustain pedal built for guitar. As we all know, first impressions count, and even from the unboxing of the pedal, it certainly doesn’t disappoint, with it arriving in a very attractive black box, with a magnetic latch for safe storage once you’re finished with it for the day. If you’re familiar with other DeadBeat products, you may realize that this pedal is a little larger than some of their other products, so therefore if you’re struggling for space on your effects pedal board, this may be out of the question for you! However, we’ve provided the measurements above, so that you can see if you have enough room! The Deadbeat Thank You pedal is primarily a Distortion & Sustain pedal, so if you’re looking for a combination of these two effects in one unit, this may well be for you. It’s fairly simple and self-explanatory to use, with it having three function knobs for operation, which include ‘volume’, ‘sustain’ and ‘tone’. We quite like the fact that it doesn’t overcomplicate anything regarding the interface functionality. But don’t mistake the limited number of interface controls for a lack of sound control, this unit can provide more than enough sonic personalization for your needs. Refer to the video demonstration to hear exactly how this distortion/sustain pedal sounds. Like we mentioned, this pedal is extremely impressive from the off-set, with it being presented in such an aesthetically pleasing way! Alongside this, as you can hear from the video demonstration, it sounds awesome! And you can buy this for under $50… It truly demonstrates wonderful value for money. 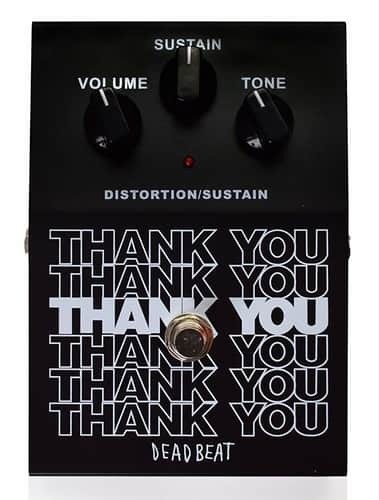 The Dead Beat Thank You is for the guitarist who’s looking for a guitar sleek-looking, distortion/sustain pedal that provides incredible value for money and high-quality audio tone. It’s the perfect mid-priced pedal in our list, and hence why we describe it as our Editor’s Mid-Priced Recommendation. The Boss CS-3 has received an average rating of 3.9* out of 5 stars from over 67 Amazon customer reviews – Read these reviews here. So before talking about the features of this unit, for those who don’t know much about Boss, I want to quickly touch upon the brand, just so that you can see the wealth of experience they bring to the table when creating their products. So Boss have been operating since 1976, and they are in fact a division of the Roland Corporation. Since this time they have seen it all, from analog to digital, and the mass of editions of each effects pedal along the way, as they add customer-requested features to models. The fantastic thing about this company is that they listen to their target market (I.E You) and hence, they’re always working on ways to make their products better… Meaning that you can have full confidence in knowing that you’re going to receive a product that has been tried, tested and products complete satisfaction, assuming you get the newest mode of course 😉 . As you can see from the customer reviews, this sustain pedal really is popular, and for good reason… Why? Well other than the refined sound, it comes with a 5-Years Manufacturers Warranty, so it’s extremely popular with professional touring/gigging musicians through to hobbyists. Ok, so some people would say that the Boss pedals are a little ‘clunky’ looking. However, we want to eliminate that argument and in fact justify why it doesn’t need improving. Boss pride themselves on providing a 5-Years Manufacturers Warranty, and the reason why they can do this is simple! Their guitar pedals are built like tanks, and the CS-3 is no different. So we want ‘clunky’ because we want it to last! 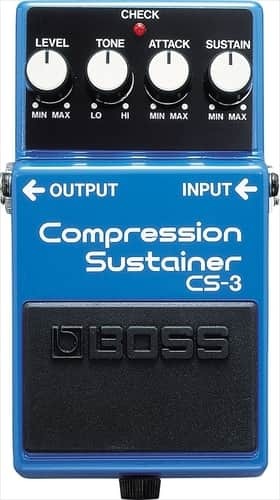 The Boss CS-3 is definitely for the guitarist who wants a high-quality compression/sustain effect, at an affordable price considering the wealth of experience that this brand provides, getting you that excellent tone. As we’ve explained, these pedals are reliable, and so if you’re after a pedal that won’t give up the ghost whilst you’re on-stage, the Boss CS-3 is your best hope! Take a look at the video demonstration of the Boss CS-3 in action. The Electro-Harmonix Big Muff Nano pedal has received an average rating of 4.2* out of 5 stars from over 98 Amazon customer reviews – Read these reviews here. The Electro-Harmonix Big Muff Nano pedal is the perfect mid/premium priced distortion/fuzz & sustain pedal for any guitarist. If you’re familiar with the Electro-Harmonix Bigg Muff series, you’ll know that it’s known for the iconic fuzz sound that you hear regularly on records, even if you’re not aware of it. Electro-Harmonix is simply the king of creating the Fuzz guitar effect. Refer to the video demonstration to hear exactly how this pedal sounds. You get a Big Muff pedal with the signature pi processing circuitry, all for an extremely affordable price (considering the price of other Big Muff pedals within the series). There isn’t much that we can suggest as far as improvements go. However, we cannot see on their website how long a product warranty is provided with this item, and so that would be an improvement as far as making their potential customers aware of this. 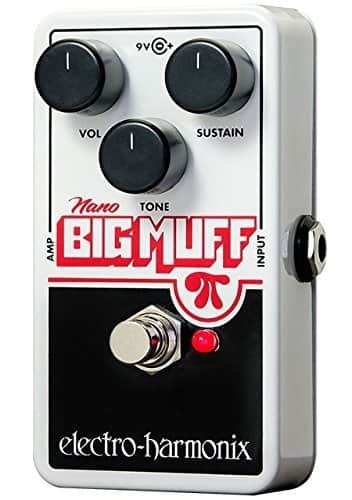 The Electro-Harmonix Big Muff Nano is for anyone searching for a compact guitar effects pedal, which provides high quality electro-harmonix circuitry for creating stellar distortion, fuzz and sustain. Take a look at the video demonstration of the Electro-Harmonix Big Muff Nano in action. The Pigtronix Philosopher’s Tone has received an average rating of 4.3* out of 5 stars from over 13 Amazon customer reviews – Read these reviews here. Well, it’s clear from the naming of this product that the founder of Pigtronix is an avid Harry Potter fan, we’re kidding! Although there is reasoning behind the naming of this product. 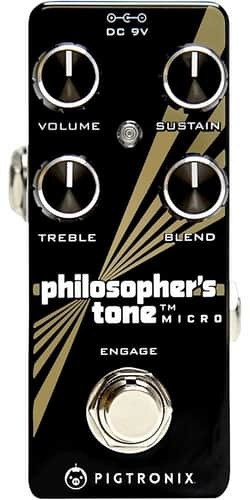 The Pigtronix Philosopher’s Tone is well-known for its ability to provide a clean sustain tone. If you don’t believe us, just take a look at the video demonstration video below. This pedal comes with 4 main interface controls, volume, sustain, treble and blend. Therefore if you’re looking for a processor that will provide more options for sound control, this may be well-suited for you. Overall, for us, we just weren’t blown away by the sound quality of this pedal, especially considering it’s price. However, that’s for you to decide. The Pigtronix Philosopher’s stone is definitely a premium-priced sustain pedal, and hence if you like the sound of this unit, and want a more boutique, unique pedal, this may be for you! Take a look at the video demonstration of the Pigtronix Philosopher’s stone pedal in action. 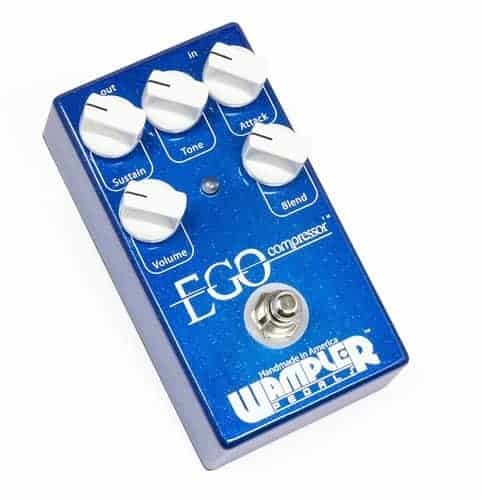 The Wampler Ego has received an average rating of 4.4* out of 5 stars from over 31 Amazon customer reviews – Read these reviews here. The Wampler Ego is the most premium-priced pedal featuring on our list… Well, we like to accommodate for ever type of reader, and hence if you’re after a hand-built compression/sustain pedal that is built in the USA, then the Wampler Ego is your match! The pedal retails at around $200, and for this price you’re getting ultra-high quality circuitry, and because of this, it sounds great! Just take a listen to the pedal demonstration video below. As the guitarist, you have a range of interface controls, including sustain, tone, attack, volume and blend… All of which constitute to helping you achieve your ideal sound. Ok, so considering the unit’s price, there really isn’t much we can say to improve. Only, any improvements would most likely, directly affect the price; So taking this into account, knowing that the price it’s unique selling point, we can’t make any improvement suggestions. The Wampler Ego is aptly named, but not for the reason you’re thinking. This pedal clearly has an ego, an elitest aura.. Mainly because it simply is better than other compressors/sustain pedals featured on this list… But you’re definitely paying the price for this level of quality. If that price is ok for you, then this is your ideal processor. Take a look at the video demonstration of the Wampler Ego in action. As with all of our pedal/equipment recommendations, we try our best to cater to every reader, and hence we segment our recommendations based on important aspects, such as price, functionality, size and product/customer satisfaction. We highly advise if you have the time, and are serious about purchasing a unit, take a look at the video demonstrations of each pedal featured within the list… It will really give you a clear, audible indication as to which pedal will get you the sound that you desire. However, without further delay, here are our Editor’s Recommendations on the best Guitar Sustain Pedal for you.